We believe in the importance of supporting our local community. We are also pleased to support Diabetes South Canterbury, the Prostate Cancer Foundation of New Zealand and the Special Children's Christmas Party. Our staff take pride in supporting our local community and are actively involved in thinking of practical ways to do this. 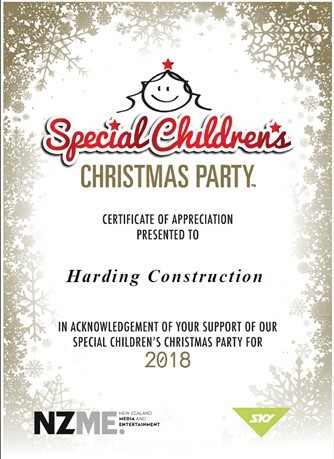 Harding Construction has been an enthusiastic and active supporter of the Canterbury Special Children’s Christmas Party each year since 2014. Event Manager, Sam Jorgensen, writes: "The Harding Construction team has not only provided generous financial sponsorship for the Special Children's Christmas Party, but has also helped out on the day, providing valuable assistance setting up and running different activities. "The Special Children’s Christmas Party gives underprivileged and special needs children the opportunity to celebrate Christmas without the limitations of personal circumstance. It has a simple goal: to put smiles on these children’s faces for at least one day each year. We are entirely reliant on the goodwill of businesses like Harding Construction to make this happen. "We are very grateful to the Harding Construction team for their consistent enthusiastic and generous support of this very special annual event."